Jasmine Jamison’s time in the military as a woman proved slightly challenging, though rewarding Photo courtesy of Jasmine Jamison. As Salem women and as humans in general we are constantly exposed to the extraordinary impact women have on the world. Although it is statistically supported that women do indeed add value to their environments, throughout history there has been resistance to women’s rights, equal treatment, and equal opportunity. Although such resistances are still prevalent, we see progress every day. In the past year, the United States Military has made revisions to some of their seemingly outdated policies regarding women in combat. Salem student Jasmine Jamison has had firsthand experience with these changes as she has served with the reserves for the past two years. Jamison, a sophomore Education Major at Salem, explained that the military has been a life-changing experience. She’s been able to enjoy the opportunities to “[meet] people from different backgrounds” while also “[being] introduced to different types of weapons”—two of her favorite aspects thus far. Although she has had a very positive experience during her time so far, she explained that she has encountered certain obstacles as a woman. Primarily, these obstacles revolved around weight regulations and requirements. As a woman, it is physically more difficult to reach certain weight goals as quickly as men. Since the female anatomy is not considered in the weight regulations, Jamison explained that she had to work a bit harder to reach the weight requirements for her height. Beyond that, however, she has experienced personal growth and professional development through serving her country. 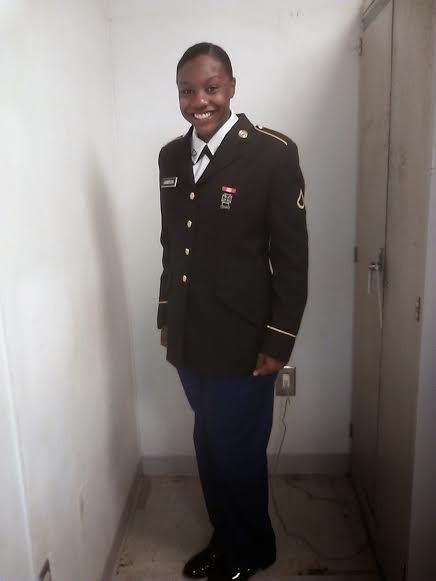 We’d like to thank Jasmine Jamison for all that she does with the U.S. Military.